Last week I was at a concert where two large fresh-cut trees had just been brought in. I noticed several insects lazily flying about the auditorium and when one landed nearby we recognized it as a cluster fly. I knew that cluster flies overwinter in attics and walls like Asian Ladybugs, but I wondered if they could also overwintering in Christmas trees. Last year I had seen these same insects shortly after we brought in a fresh-cut Christmas tree as well. Did they come in on the trees? Cluster fly larvae are non-native imports from Europe. They are not considered invasive in northeastern Wisconsin because they are parasites on earthworms, which are also not native to our area. In the autumn adult flies search out protected over-wintering sites. In the wild these would be under bark or in dense vegetation or other crevices in rocky piles or cliff faces. Of course buildings mimic cliff faces to these insects, and the flies will cluster under siding and in walls or attics. Christmas tree farms are likely to provide good overwintering sites if there are brush piles or dead trees or sheds nearby. But it isn’t too likely they could use living Christmas trees successfully because there are few good places for them to hide. I spoke with UW Madison entomologist Phil Pellitteri who agreed the flies are unlikely to find good winter protection in Christmas trees and suggested that the flies were probably in the building and were roused by warm outside temperatures. Wherever they came from they are slow and easy enough to catch. Unlike other “house” flies, cluster flies do not feed in our houses and are unlikely to spread disease. 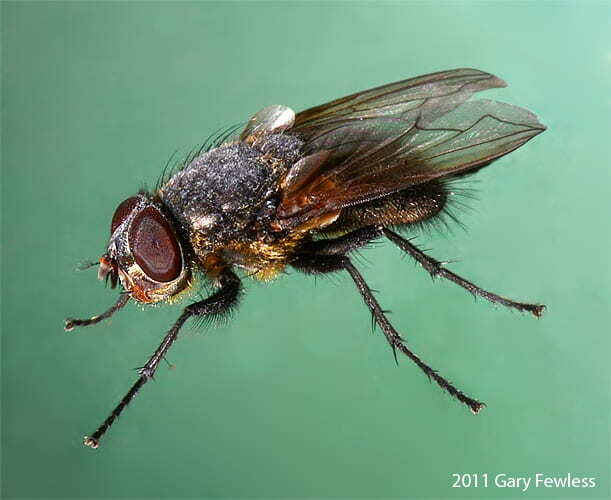 Cluster Fly (Phormia rudis). Photo by Gary Fewless. Are cluster flies a pest? That probably depends on how many there are in one place. They can sometimes accumulate inside walls and attics in large numbers. When temperatures rise on warm days some flies become active and make their way into living spaces. Once inside, they are not easily controlled by pesticides. Experts at the Entomology department at Penn State and UW Extension suggest killing flies trapped in walls or attics might makes matters worse because the dead flies will attract other more onerous pests like carpet beetles that would invade closets and rugs looking for wool and furs after they devour the flies. Real Christmas trees are clearly the better choice for the environment when compared with artificial trees. They sequester carbon, produce less pollution and waste when recycled, and tree farms provide habitat that helps to preserve local biodiversity. Sometimes people are worried about that biodiversity, especially insects or spiders, coming inside with their trees. The best way to remove any stowaways is to give the tree a good shake before bringing it in the house. Fresh Christmas trees should never be sprayed with chemical pesticides, which are flammable and environmentally unfriendly. And of course sprays would ruin that wonderful fresh conifer scent.